My slow cooker has, unquestionably, and without doubt helped me with some very successful and undoubtably delicious meals. I was shocked to find out that several of my friends had one that had never been used! I thought that certainly there must be some mistake. What were they afraid of? Why were they letting this super simple, yet perfectly lovely kitchen appliance sit unused? Point in fact is that a slow cooker can make your life easier much in the same way a wooden spoon helps you stir. Hence, the reason for everyone to own one. In light of this situation I had to take action and share what I knew. I felt it was my job to pursue this further and share in the joys of slow cooking. Before long I was witnessing several converts who were starting to understand the unquestionable necessity of this little appliance. Undoubtedly, one of my families favorite recipes is Slow Cooker Pot Roast. First, originally my mom’s recipe, as many are, Easy Slow Cooker Pot Roast is requested so often that I nearly always find myself cooking this fall/winter classic in the spring. Slow Cooker Pot Roast has also been a recipe I rely on when entertaining. Subsequently, I even use the recipe for large crowds or buffets as you can easily take out (or borrow) a second slow cooker. Lastly, it’s the perfect way to bring family and friends around the table together without any stress at all, and consequently, nearly everyone finds themselves with full bellies and hearts. To that end, ask someone to bring a crusty baguette, and another friend to bring a good red and you’re ready for a dinner that’s easy to put on the table, and will always keep coming back for more! An easy slow cooker recipe that will keep your family asking for more! Step 1 Pat the bottom round dry with paper towel. Step 2 Dredge the bottom round in the flour. A light covering will do. Step 3 Heat the oil in a large skillet. Step 4 Place the bottom round into the skillet and brown on all sides. Step 5 Put the bottom round into the slow cooker. Step 6 Add the onion – 1 piece on each side. Step 7 Add the mushrooms, including the juice of two to three of the cans. Juices should reach 1/3 of the way up the roast. Reserve the leftover juices in the event that you need them. Step 8 Add the bay leaf. Step 9 Pour the onion soup mix over the top of everything. Step 10 Cook the pot roast on low for 8 hours. It should be fork tender at the end. Step 11 If you like a thicker gravy, you can whisk in a can of cream of mushroom soup. We usually stick with the au jus. Of course, there are other adjustments you can make to make this recipe completely yours. For instance, perhaps another choice is to add carrots and potatoes rather than serving vegetables on the side. Personally, I would cook them separately and add them to the pot for the last 25 minutes of cooking time because they tend to get mushy when in a slow cooker all day. To that end, I ultimately decided after trial and error that by cooking the vegetables separately the taste of the carrot isn’t overwhelming, and as a result, the potato never gets mushy. 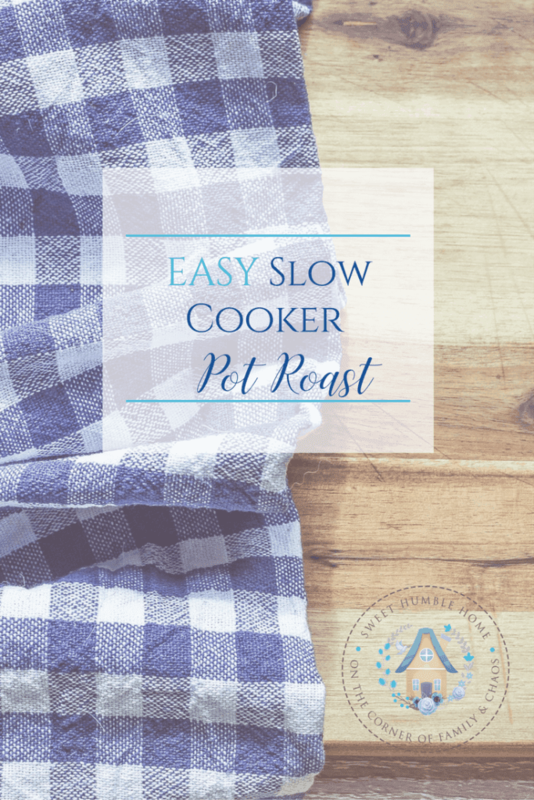 I hope you enjoy this classic Easy Slow Cooker Pot Roast recipe! It’s without doubt one of our family favorites that I plan for whenever I need something I know they’ll surely love (especially in fall and winter). As a matter of fact, check back for additional adjustments that take this simple recipe in different directions! In other words, you’re going to find this recipe so versatile that you’ll want to add it to your regular menu planning rotation! Finally, if you would like a copy of my meal planning worksheet, by all means sign up below to receive a free copy! Every Sunday I plan my menu for the week using this worksheet, and ultimately, I feel more organized and otherwise together! All things considered, it really is a lifesaver! With all of the otherwise crazy things going on around me the menu planning worksheet is arguably one of the best sanity keepers I’ve come up with! This is the best pot roast I have ever tasted! Thank you, Ursula! I’m so happy you enjoyed the recipe!